February 2016 Employee Spotlight: Nici | Justifacts Credential Verification, Inc.
What do you do as a Verification Specialist at Justifacts? I call employers, schools, and references to verify an applicant’s information. I like calling references and hearing the nice things that people say about their colleagues. It makes me think about what my coworkers would say about me and makes me want to work hard and strive to be a better person. If you could switch your job with anyone else within Justifacts, whose job would you want? I’d switch with Bruce, he always seems so happy! What do you like best about working at Justifacts? My team, everyone is really nice. I’ll be celebrating my 5 year anniversary on October 2nd of this year. I have two wonderful cats Patches O’Houlihan and Lebowski. Patches is the troublemaker that likes to play fetch with twist ties. Lebowski tries to stay out of trouble, except when he steals the occasional receipt or piece of paper to crumple up and play with. I’m from Penn Hills, but I spent years living in southern California. I love to travel, but I’m mostly a homebody. I’m happiest when I’m just hanging out at home. 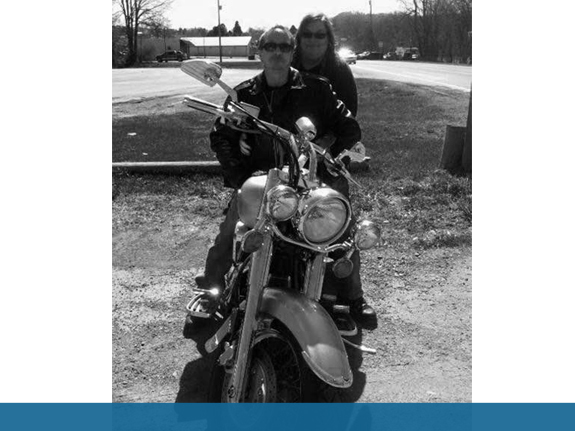 I’m riding my motorcycle with my husband.